What It’s About: Succubus Kia (Allyson Ames) attempts to corrupt the soul of Marc (William Shatner), but when she fails she summons an Incubus (Milos Milos) to strike at Marc’s sister Arndis (Ann Atmar). Why Watch it Today? : Today is the birthday of L. L. Zamenhoff, the creator of Esperanto, the artificial language spoken in today’s film. Zamenhoff hoped that Esperanto would unite the world, but here Esperanto is used to make the film feel otherworldly. 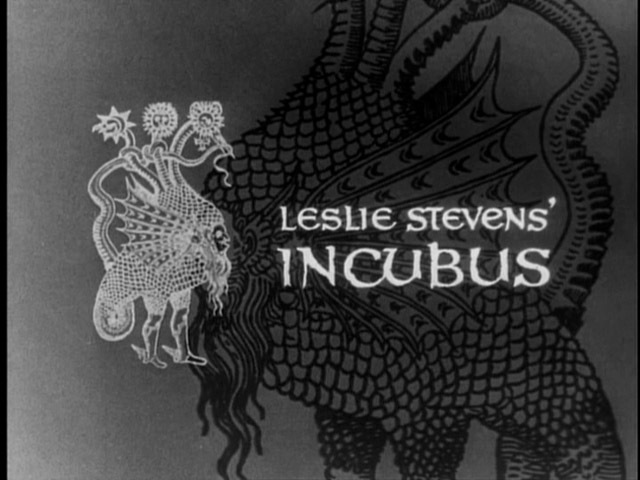 The device succeeds, to a degree, but also enhances the feeling that Leslie Stevens, one of the creator’s of The Outer Limits, sought to emulate foreign art films, particularly the work of Ingmar Bergman. The mix of Bergman elements with California locations, 1960s television sensibilities, relatively unknown actors (Incubus was filmed pre-Star Trek) results in a strange and compelling, if not necessarily good, film. This entry was posted in Arthouse, Black and White, Demons, Fantasy, Horror, Independent, Movie of the Day, So-Bad-It's-Good and tagged allegory, before they were famous, Conrad L. Hall, Daystar Productions, game with the devil, homage, incubus, Leslie Stevens, low-budget, rip-off, sacrifice, succubus, William Shatner. Esperanto works! I learned it in my late teens, and I’ve used it in speech and writing in a dozen countries over recent years. As a planned auxiliary language, it is easier to learn and use than national tongues. As an Esperanto speaker I found Incubus terrifying! Bill Shatner’s pronunciation that is, not the film. From what I’ve read, Shatner puts a French-Canadian accent on his Esperanto pronunciation. I had no idea that Esperanto was still being taught. Esperanto is celebrating its 125th anniversary next year. I’m sure we’ll hear more about that shortly. It’s being taught and used by a huge number of people. I found it of use in Argentina earlier this month. William Shatner + Esperanto sounds amazing! He apparently speaks it with a terrible Canadian accent! I was actually surprised at how almost good it is; it’s less a problem with the production, and more that the Esperanto switch, intentionally or not, basically boils down to “let’s see if putting this in another language will automatically convey the mood and quality of a Bergman film”. Unsurprisingly simply uses some of his themes, a vaguely Medieval setting and subtitles doesn’t make this another Seventh Seal.